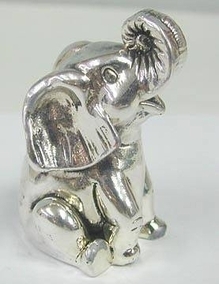 sterling silver baby elephant sitting down miniature An adorable sterling silver baby elephant sitting down miniature. This figurine looks like a baby elephant sitting down on his bum sticking his trunk up and smiling which makes this elephant look very realistic. 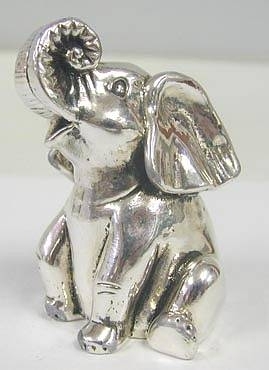 Elephant trunk up is believed to be a good luck charm. This figurine was made in the electroforming method. Measurements : Marks : Width: 1.7in. / 4.31cm. Height: 2.4in. / 6.1cm. 1 inch = 2.54cm 925 for sterling silver. Weight : 39.5gr. / 1.27oz.